The name "iPaq" evokes distant memories of those monolithic PDAs from a decade ago. Fortunately, the HP iPaq Glisten ($180 with a two-year contract from AT&T; price as of 12/15/09) looks nothing like its ancestors. But its operating system, however, makes the Glisten feel like it is stuck in the past--it runs the basic Windows Mobile 6.5 user interface. Slightly resembling an older BlackBerry Curve, the Glisten's front face is split between a 2.5-inch display and a full QWERTY keyboard. The Glisten is attractive and will look right at home in any executive boardroom with its soft black rubberized body and silver detailing. The Glisten feels great in the hand as well, though it is a bit on the larger side compared with other phones that have similar designs. Rather than a trackball or trackpad, the Glisten has a circular directional pad surrounded by your standard Windows Mobile array of hardware buttons: Talk, Start menu, OK, and End. The top of the Glisten has the Power button and a dedicated Wi-Fi on/off key. The left side has the volume rocker, and the right side has both a mini-USB port and a standard 3.5-mm headphone jack. A stylus is on the bottom. One of the Glisten's best features is its keyboard: With its large, rounded keys and variety of customizable shortcut keys, it is of the same caliber as the BlackBerry Bold's keyboard. The letters are clearly marked and nicely backlit, so I had no trouble reading them. The Glisten has a gorgeous AMOLED touch display, though it's a bit small. AMOLED technology boasts brighter colors, better viewing angles, and longer battery life. The touch display was fairly responsive, but I sometimes found that it reacted slowly to my gestures and swipes. And unfortunately, this great screen seems sort of wasted on the lackluster user interface. Unlike with the Samsung Omnia 2 or the HTC Tilt 2, there's no touch-friendly or aesthetically pleasing overlay running over the Windows Mobile 6.5 OS. While version 6.5 is a big improvement in usability over 6.0, it is still difficult to navigate--especially on a touchscreen this small. When you first turn on the phone, you're greeted with the Today screen, which lists shortcuts to your text messages, e-mail accounts, photos, music and more. Scrolling through this screen on phones with larger displays is a much smoother experience; again, I found the 2.5-inch display cramped. Like other Window Mobile phones, you can sync the Glisten with your Outlook calendar and e-mail account. Upcoming appointments or new e-mails will show up on this screen. The Windows Mobile Start screen displays your icons in a honeycomb pattern. You can customize the Start menu with a background image and add more widgets and applications to it via the Microsoft Marketplace. Move preferred icons to the top by pressing down on them for a few seconds. Thankfully, you no longer have to use the tiny scroll bar to navigate through the menu; instead, you can flick the screen to scroll to the bottom. The Glisten ships with the updated Internet Explorer Mobile. To zoom into a page on Internet Explorer Mobile, you tap twice on the area that you want to enlarge. Though the effect isn't as slick as the multitouch pinch-to-zoom control, it works just fine. Browsing is adequate overall, but again, the small screen makes it difficult to navigate around content-heavy pages. The Glisten also has Wi-Fi connectivity, which allowed quicker Web surfing than AT&T's 3G Network. Call quality was solid for the most part, though one of my contacts noted that my voice sounded slightly distant. I also heard a faint hiss over most of my calls, though it wasn't distracting. In its multimedia capabilities, the iPaq Glisten is a bit disappointing. The bland Windows Media Player supports MP3, AAC(+), WMA, and MIDI audio formats; and MPEG, WMV, H.263, and H.264 video formats. Audio quality was adequate, but video playback was choppy and a bit pixelated. The 3.1-megapixel camera was a bit of a letdown. While the Glisten has a flash, my indoor photos still looked dark, and the details lacked sharpness. There was also a slight shutter lag, so a few of my pictures came out fuzzy. 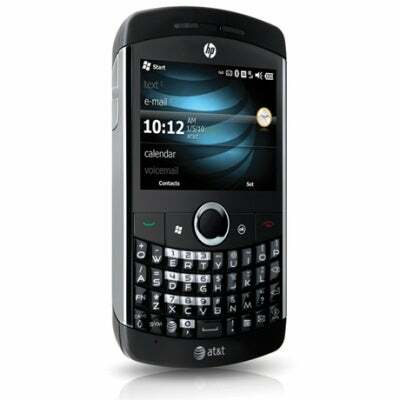 The Glisten also comes with HP's Photosmart Mobile software for editing photos. Support for Microsoft's Mobile Office Suite and Exchange, paired with the excellent keyboard, makes the HP iPaq Glisten a solid business device. But the size of the touchscreen, along with the bare-bones Windows Mobile OS just isn't very user-friendly and detracts from the phone's overall experience. Also, if you want to use your phone for taking casual snapshots and playing videos, you'll likely be disappointed with the Glisten. The previously mentioned Samsung Omnia II (Verizon) or the HTC Tilt 2 (AT&T) might be stronger alternatives, as they not only offer all of the great enterprise features of Windows Mobile, but also have larger touchscreens and more multimedia options. The HP iPaq Glisten has some great features for business users, but the small touchscreen can be difficult to use with Windows Mobile.